Kulai Brigade Alumni: You Know Them?? If you know them, please forward me their names and contacts. They are the pioneers of 1st Kulai. Picture taken on 25th July 1959. 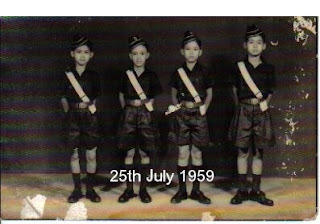 Reading your Kulai Alumni material - it brought back memories of when I used to visit 1st Kulai in the 1960s. 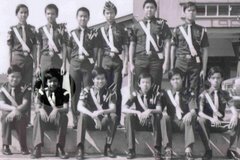 I was Captain of 1st JB Coy. I knew Miss Joyce Lovell. One of the Officers was a Mr Nadarajah.. Right now I am still Hon Vice-President of tjhe Malaysian BB. Also Hon President of the Stedfasts Assns in the UK and Ireland and Internation Stedfast Secy. From what I see you should form a Stedfast Assn as Penang, KL, Kuching, Sg Petani have done and also register each member with the BBM HQ as Alumni Members. Howe about it ?